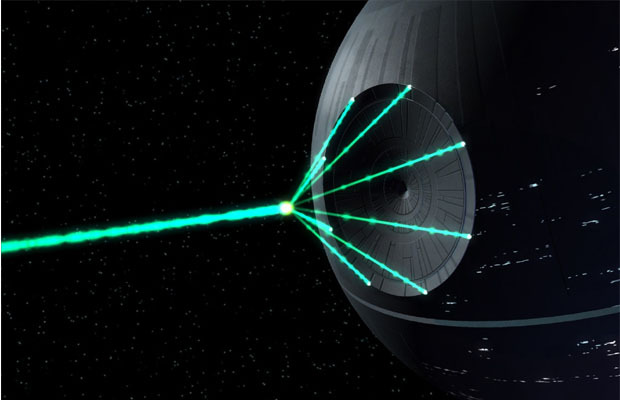 Could the Death Star Be Resurrected for 'Star Wars: Episode VII'? Could the Death Star Be Resurrected for ‘Star Wars: Episode VII’? In a sneaky move by director JJ Abrams, we may have been shown a new hint about a plot development in Star Wars:Episode VII. While promoting Apple’s new smartwatch via Twitter, Abrams may have intentionally revealed a major clue: the return of the Death Star. In the background of the photo, there is a distinct pattern on the table that the note is lying on, which looks eerily similar to the pattern on the inside walls of the Death Star. Coincidence? It’s possible, but then again, it could be Abrams toying with fans to get conversations started about the film–it wouldn’t be the first time that he has revealed a major clue in such a nonchalant manner. It’s also possible that the film could feature a flashback involving the Death Star, rather than it being directly involved in the present-time plot. For now, fans will have to wait for the next clues to drop before the release of the film in December 2015.